A fine textured fern with brightly colored ruffled fronds. 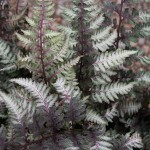 The dark violet red interior of the frond is contrasted by bright silver edges. The stems are burgundy-red. It prefers constantly moist soil and part to full shade. The fronds may be used in floral arrangements. Useful for a ground cover in the shade, or even in a container.